When a 7.8 earthquake rumbled through Nepal on April 25, 2015 it killed nearly 9,000 people and left 3.5 million homeless. No one summited Everest for the first time in 40 years. As Nepal began the massive rebuilding effort, the disaster left many asking if trekking and climbing in the Everest region would return? The simple answer is yes. Nepal’s resilience will be on full display this spring as foreign climbers/trekkers are returning. The 38 kilometer trail from Lukla to Everest Base Camp through the Khumbu Valley is open, now that trail and guest lodge repairs have been completed. The Nepalese government assures visitors that the routes are open and safe. Sherpa teams rebuilt the aluminum ladder bridges over the Khumbu icefall last summer and it didn’t take long before Everest summiteers were back chasing their pursuit of the world’s highest peak. Japanese climber Nobukazi Kuriki was the first to attempt climbing Everest since the quake, but his solo effort without oxygen came up just short in late September. Kuriki was making his fifth attempt and it was his go-for-it spirit that typifies those willing to return to Everest despite the recent history. “The main purpose of my climb is to spread the message that Nepal was safe for climbers and trekkers even after the earthquake,” Kuriki told the Associated Press. Tusker’s 18-day Everest Base Camp trek embarks on April 15th, and Tusker founder Eddie Frank said all Tusker’s Sherpas will be crewing on the 2016 trek. Tusker raised $18,500 among its clientele for the Sherpas to rebuild their homes. Sonam Lama, Tusker’s Nepali partner, said the most trail damage occurred at Toktok between Phakding and Namche on the trek’s second day. After extensive work the trail is now fully restored. He added that there was sporadic damage to homes and lodges along the Everest Base Camp route, but the rebuilding is now 100 percent complete and all lodges used in the past will again host Tusker’s trekkers. The Nepalese government is planning a 22 kilometer road building project that will allow vehicles to reach Everest Base Camp but on a route far removed from the current trekking route. The road is designed to provide an alternative to the flights between Kathmandu and Lukla that most trekkers take. Flights sometimes are delayed because of fog. 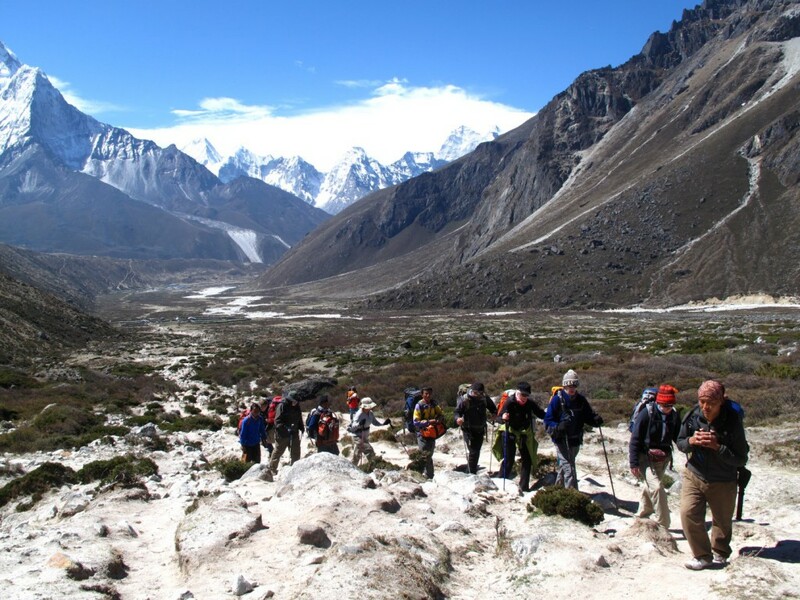 It will also make it less expensive to bring food and other essentials into the Khumbu region that now requires a seven day trek or flight. There is a road to Everest Base Camp from the China side through much less scenic territory. Eddie said the 2016 season is a good time to go because the trails will be less crowded as the numbers of tourists will likely be down, but he has been surprised how many trekkers are still keen to go.